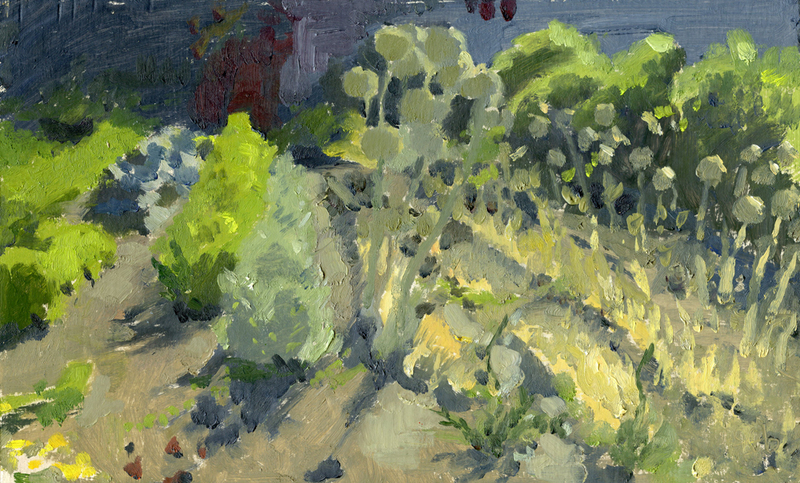 I’ve been active in the Plein Air Painters of Oregon for a couple of years and they decided to do a Southern Oregon Trip, and being one of the only members living in Southern Oregon I was nominated to organize the event. Anyway, I set up painting in Hanley Farm, Central Point, downtown Jacksonville – a pretty corny old west themed little place with a pioneer cemetery, and then winery and finally paint out in and around Ashland, including Lithia Park and North Mountain Nature Park. Anyway, the members are very lovely folks and I like meeting people who paint, but in the course of organizing this event, I have grown more and more aware of how I don’t like these kinds of events. Mainly it’s because I hate painting at farms, wineries, wilderness areas. They’re already beautiful – what do I have to add? I’m afraid this post is turning negative, but what is really important to me is that I’m actually finding a consistent theme that I like to paint – and am finding what about it turns me on. You might think it would come naturally to an artist to know what they want to paint, but when you’re a student with an open mind you wind up absorbing a lot of stuff that helps, along with stuff that hinders. When you’re a student in a classical tradition you don’t always get to choose your subject, you’re working a lot on technical issues and you can lose your way. Eventually the creative liver has to send the good stuff to the blood stream the bad stuff to the colon. So I’m at a point where I’m separating what I want from what I don’t want right now. What I like about this piece is the pattern and the feeling of light. I like that you lose the specific items too. However, I don’t like the crop. I may saw this strategically. In fact, I’m pretty sure I will. Or maybe not. Okay – I like how easily this one fell into place. It was painting number two of the day and I usually find that the second painting of the day is easier, that I’m more in the flow, that colors are mixed on the palette and so it’s almost effortless. 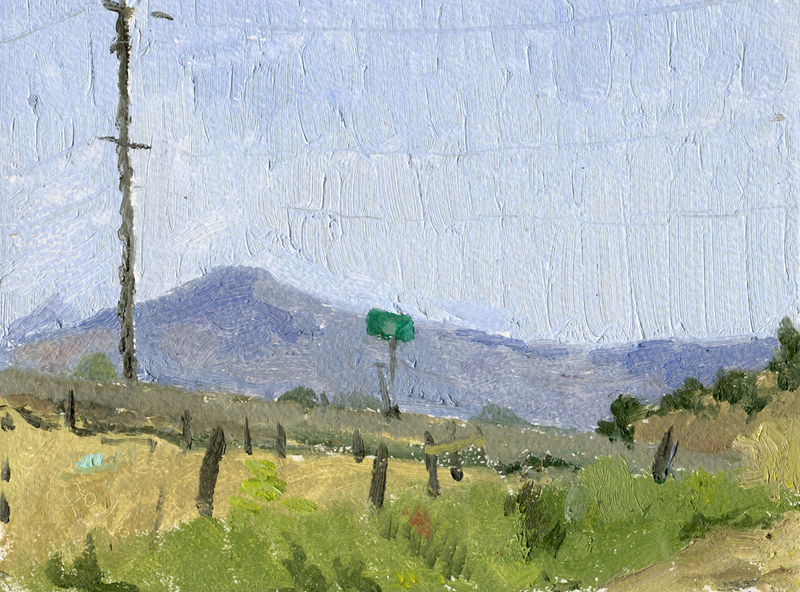 I like painting things in the distance – when they’re in the distance they can be read better. For the afternoon we moved to Jacksonville Cemetary and it was brutally hot, dry and I was tired. 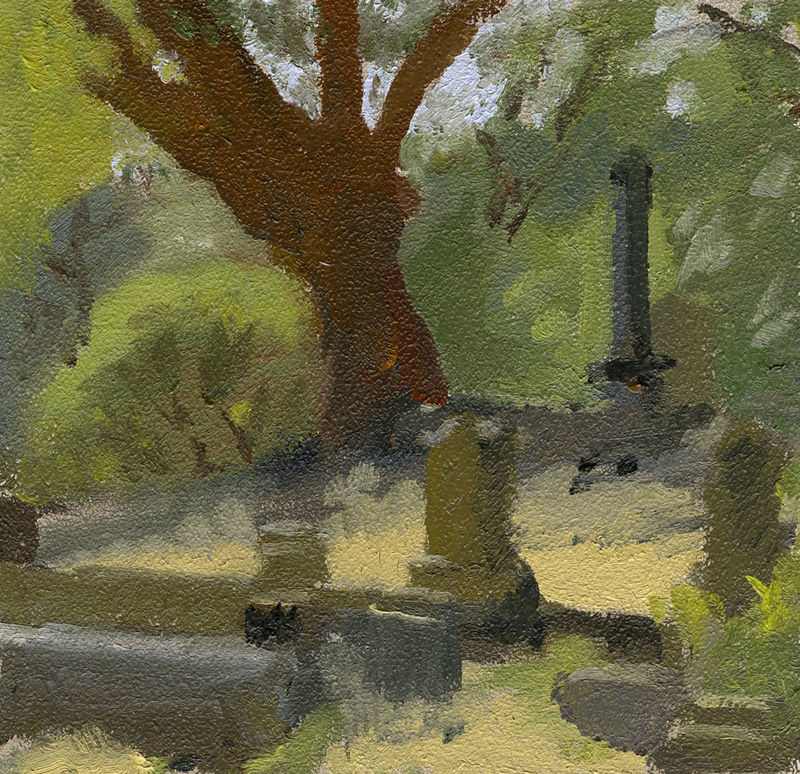 There was so much to see, everywhere you turned were shadow and light, blocks of graves and dappled bits from the madrone trees. I did this very quickly, getting pretty lazy by then and not really inspired by the setting. The next morning we painted in a winery, and I did a painting that is so awful I won’t show it, and by that time I was TRULY over all the places we were painting, so instead of heading to Lithia Park for the scheduled afternoon paint out I went to Phoenix, my beautiful town of suburban decay and started work in a spot that’s been calling my name – and lo an behold – I’m happy with the painting. Awesome post! I know exactly how you feel. I have to have a connection to what I paint- I believe the right word would be enchanted. If I’m not feeling the magic there is absolutely no hope of anything good happening. I really like your first painting- it’s peaceful and I love the colors. 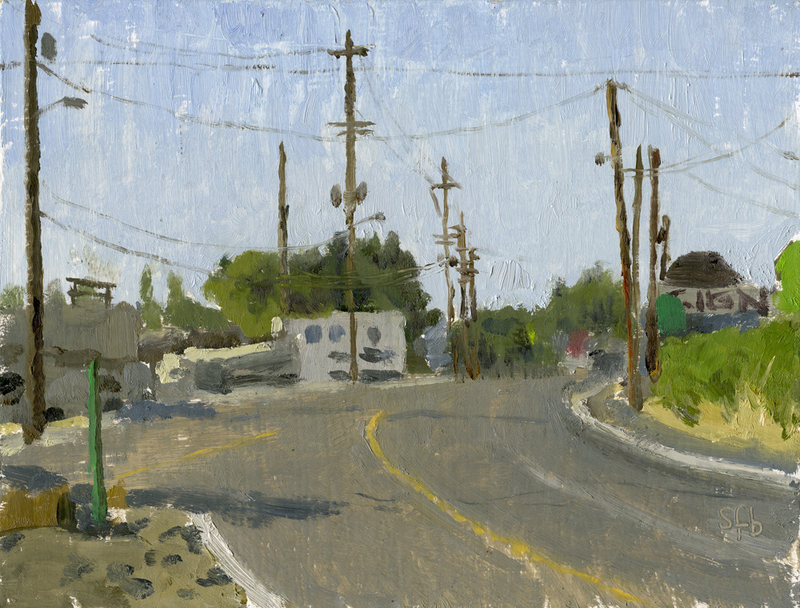 “Sign and Street” has that feeling of something special that the other paintings don’t have. Funny how it works that way! Thanks Nathalie – and yes, totally – why should we force it? It does no good for anyone! You are a good critic of your own work. The final painting of the street in Phoenix is wonderful. There is so much to look at and think about. The telephone wires connect and dissect simultaneously. Love the farm painting. Looks like it was a really fun paint-out! Lovely paintings Sarah- I would have loved joining you! Thanks Annamaria – If you’re in Oregon, sometime I bet we will cross paths!